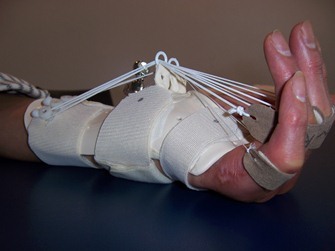 Splints can be used to support tissue or to remodel tight structures. 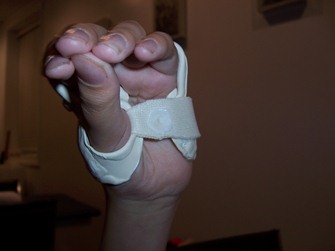 Splints may also be used adjunctively in treatment of many diagnoses. 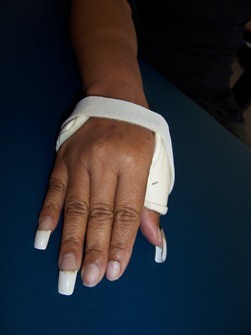 Loya Community Hand Rehabilitation Center specializes in custom-designed splints for treating a wide variety of hand diagnoses. 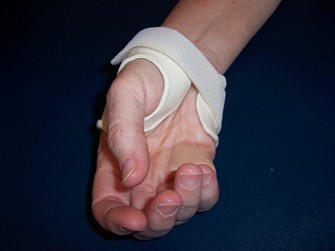 Prefabricated splints are also available. 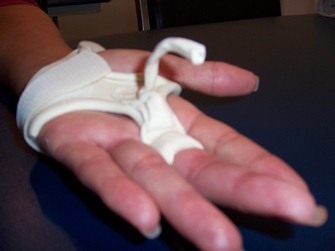 Below, you will find several samples of custom splints available to our patients. 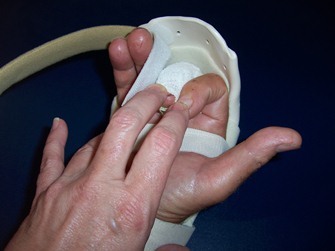 For some patients, a static extension splint can be the optimal choice for s/p EPL repair. 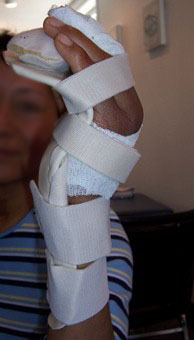 After healing incremental increases of IP flexion was permitted. 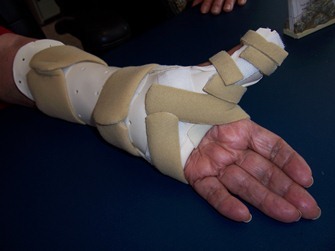 This patient was provided a static progressive splint to establish IP flexion after prolonged immobilization post-partial amputation. The bridge ensured a 90-degree angle of pull. The Merritt Component allowed static end-range hold to IP joint. 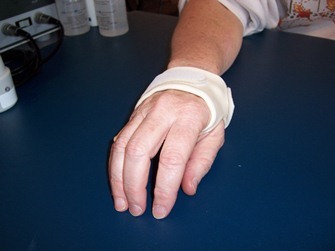 Mr. R. had a 45-degree extensor lag after radial head surgery. 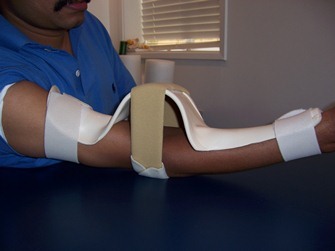 This splint allowed the elbow to rest in its maximum available extension. 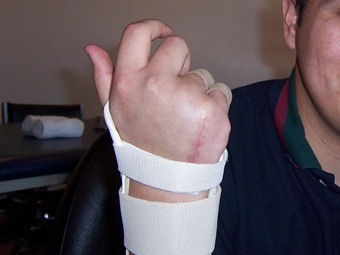 The three-point/counter-force design incrementally urged the elbow into increased extension while he slept at night. 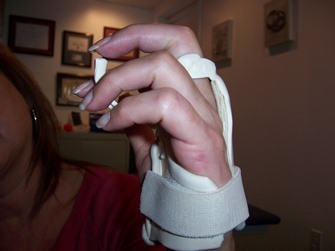 A dynamic splint allows the digit to rest in full flexion but allows full volitional extension. 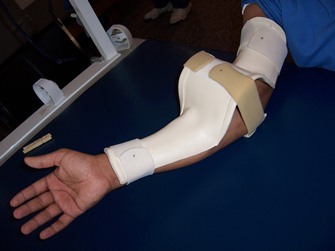 End range hold gradually increases the avialable MP flexion, and places the lumbricals to the ulnar digits in a position of their best mechanical advantage. 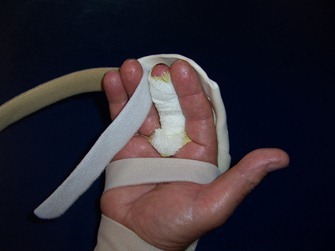 This splint contains elements of both a static progressive splint and a dynamic splint. 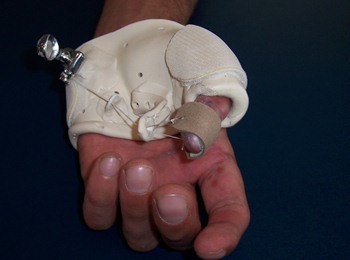 The pinky's motion is constrained by a Merritt component, one tool used for static progressive splinting. The other digits are allowed volitional motion via elastic bands. Mr. R. lascerated the FDS of the MF while washing a wine glass. 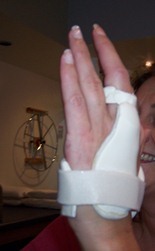 Followed by active extension to within the confines of the dorsal block splint. 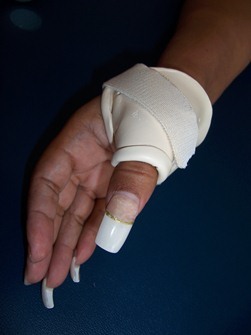 Between exercises the patient's digit was kept at the active available digit extension carefully avoiding any passive extension. 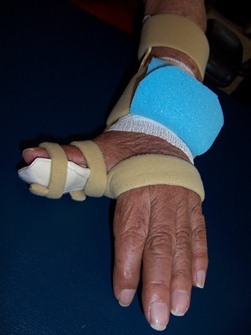 This patient's IF and MF were left free to allow limited fine motor function. 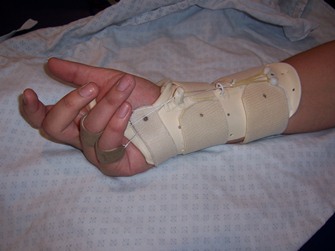 Care was taken to provide just enough flexion of the ulnar MPs to allow adjacent digits to flex. 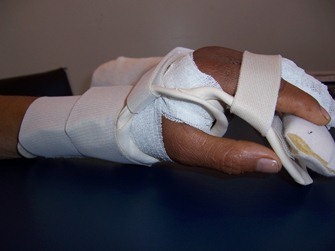 Functional or working splints allow the patient to rest and support the painful CMC joint during hand use. Radial view. 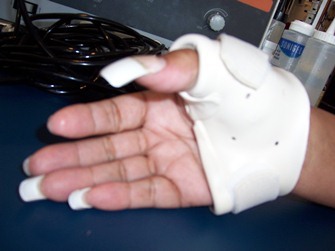 This splint has a volar opening. Dorsal view during writing. Dorsal view. Normal arch of the hand is ensured. 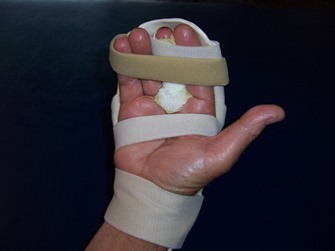 This patient could not flex the IP joints after injury. She could not approximate the ball with the MF. A volar block component ensures movement of the IP joints. The "target" is placed just beyond the available ROM. 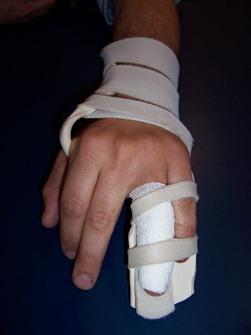 This is an example of a "target splint". Dorsal view shows the MP is blocked from flexion to direct torque only to the IP joints. 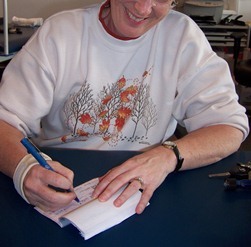 As the patient approximates the "target", it is incrementally reduced in length by a quarter of an inch. The width of the pillow was reduced at each session until full "intrinsic plus" position could be achieved. Here the uninvolved digits were also supported to prevent pull on a repair via the juncturae tendinum. Mr. C. showed median and ulnar nerve palsey after a virus attacked his spinal cord. 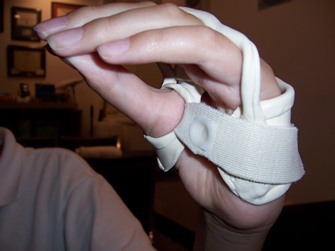 This splint prevents clawing of the digits. 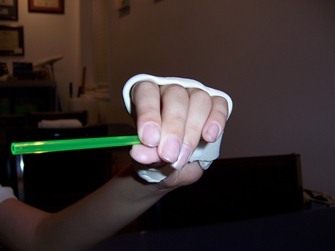 The opponent component places his thumb in a position of function. 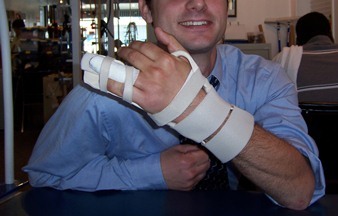 This splint also serves as an "exercise splint" as he is able to use his hand for functional tasks. 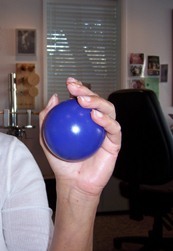 The lumbricals and thenar muscles can be engaged. 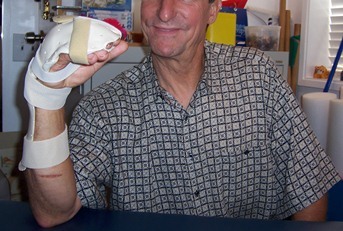 Now Mr. C. can hold objects and use his hand for activities of daily living.